An Apple a Day . . .
What is so good about an apple? Is it the color, ranging from ruby red to pale pink? Is it the crunch? The sweetness? Or is it, instead, a combination of all of these qualities, plus the natural goodness derived from the apple's secret ingredients — phytonutrients? If this were a multiple choice quiz, the answer would be "all of the above". Importantly, in addition to possessing numerous appealing physical qualities, apples contain an abundance of health-promoting biochemicals known as phytonutrients.1,2 These specific organic molecules are derived not only from apples but many other fresh fruits and vegetables, and help power the immune system, protect against cancer, maintain healthy eyes, and assist cells in clearing out metabolic waste products such as free radicals. 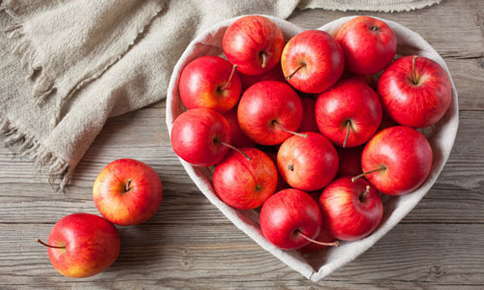 These are some of the reasons why "an apple a day" is so important to good health. One could also add "an orange a day", "a tomato a day", "a squash a day", and "a serving of broccoli a day". Overall, a healthy lifestyle includes eating at least five servings of fresh fruits and vegetables each day. Good nutrition helps support our other healthy lifestyle choices, including doing at least 30 minutes of regular, vigorous exercise each week and obtaining sufficient restful sleep. The time and effort we spend in consistently achieving these healthy lifestyles help us reap the substantial rewards of a lifetime of good health. As well, regular chiropractic care helps us put everything together in the arena of long-term health and well-being. By detecting and correcting spinal misalignments and areas of spinal dysfunction, regular chiropractic care helps ensure that the nerve system, the body's master system, is working at peak capacity. In this way, regular chiropractic care helps ensure that all other physiological systems, including the cardiorespiratory, gastrointestinal, and endocrine systems, are doing their jobs effectively. Regular chiropractic care helps us get the most out of our commitments to a healthy lifestyle and helps our families and ourselves achieve high levels of health and wellness.